The secretary of state told NBC News' Andrea Mitchell on Friday that he hoped Trump and North Korea's Kim Jong Un would meet again "before too long." WASHINGTON — Secretary of State Mike Pompeo said Friday that the meetings between South Korean President Moon Jae-in and North Korean leader Kim Jong Un represented "important steps" in the effort to denuclearize the Korean Peninsula. The two leaders discussed denuclearization "in a material way" for the first time, Pompeo told NBC News Chief Foreign Affairs Correspondent Andrea Mitchell in an interview. Though the talks resulted in a new agreement between the two countries, the secretary of state described the progress from those talks as incremental. 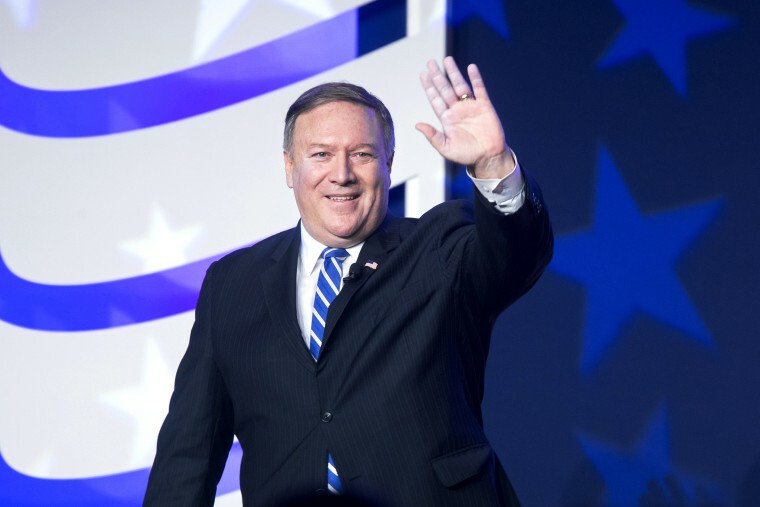 "There's much more work that remains to be done," Pompeo said describing the progress from the talks as incremental. "We have the patience and determination, and we believe the world does, too, to achieve this goal." Following the meetings between the South and North Korean leaders, Kim said he would dismantle the Yongbyon nuclear facilities if the United States and South Korea were to take corresponding measures. Kim was not specific in his request. Both Koreas have been pushing for the U.S to sign a declaration officially ending the Korean War. But Washington wants to see meaningful steps by Pyongyang towards denuclearization before further U.S. action. So far, North Korea has not met U.S. demands to put forward a declared list of their nuclear sites or stockpiles of weapons. They have not agreed to a timetable for dismantling those sites and weapons. And there has been no plan established for inspectors to verify the dismantling is irreversible. Since the historic June summit in Singapore between President Donald Trump and Kim, progress toward denuclearization has been slow, if not stalled. Trump cancelled Pompeo's trip most recently scheduled trip to Pyongyang just hours before his expected departure. The secretary said Friday that he hoped that further in-person meetings would take place soon, adding that a second summit between Trump and Kim would ultimately be up to the president. Following the Kim-Moon summit this week, Pompeo invited North Korean Foreign Minister Ri Yong-ho to meet on the sidelines of next week's United Nations General Assembly and set the new goal of denuclearizing the Korean Peninsula by 2021. The meeting between the two diplomats has not yet been confirmed. "It is good to see the summit of the two Koreas of President Moon and Kim Jong-Un, but the United States is going to be the key to this and I hope that Secretary Pompeo can drive it forward," former U.S. ambassador and State Department official Nick Burns said on MSNBC's "Andrea Mitchell Reports," "because President Trump has not been as disciplined as he should be." Pressed on the latest in a series of sanctions violations acknowledged by the Trump administration since Trump and Kim met in June, Pompeo said the government was working on closing those "gaps." “There’s always gaps,” the secretary told Mitchell. “We’re working diligently on enforcement of those Security Council Resolutions and those economic sanctions will remain in place until we get to the end." Pompeo will chair a UN Security Council meeting on North Korea and the importance of enforcing UN sanctions next Thursday, during the United Nations General Assembly. According to U.S. Ambassador to the United Nations Nikki Haley, every member country’s chief diplomat will be in attendance.